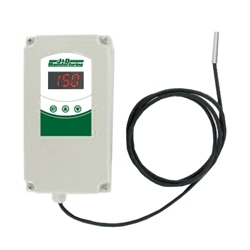 The JDDT1 single stage & JDDT2 dual stage temperature switches from J&D Manufacturing provide reliable temperature control with installation friendly weatherproof enclosures. The bright, easy-to-read LED display shows the current output status and the temperature measurement. All controls should never be loaded by more than 80% of the motor or heater nameplate current amps.